Since its advent in 1991, the Portable Document Format standard, or PDF, has become an indispensable part of the tech universe. Once a proprietary standard, its original developer Adobe released the PDF as an open standard in 2008, making it free for other developers to work with. Today, the PDF has become a critical tool for attorneys, HR managers, and publishers, and the standard digital format for any important document. The ongoing goal of the PDF standard is to make it easy to share documents between different operating systems and devices while preserving the content and design of those documents. PDFs can’t be altered the way standard word processing files can without leaving a digital trail, and they can be password protected to ensure that only authorized eyes get to read them. This makes the PDF very useful for more sensitive correspondences, and the ubiquity of free PDF readers (including Adobe’s own Acrobat Reader) means that everyone has easy access to PDF files. But while the PDF has an impressive number of capabilities, it also has its limitations, particularly when you need to edit or otherwise make changes to a document saved in PDF format. If someone sends you a text file to review, you can easily edit or mark up the document. Not so with the PDF, where editing must be done in relatively crude fashion, akin to scribbling on a printed page with a red pen and a highlighter, unless you have custom software for the task. For those who need to edit the content of PDFs (instead of simply marking annotations on the file), a few options exist. One option is to use software designed to edit documents in their native PDF format. Adobe Acrobat (the full version) is designed to do this, as are a number of third-party tools that tend to be less expensive. These tools function like a word processing tool, letting you manipulate the text and images in the PDF before saving the file as a new document. While these tools give you direct access to the PDF file, they may require a learning curve to master and many of them are quite expensive to purchase. For many users, a better option is to convert the PDF to another format, then edit it in your favorite application. 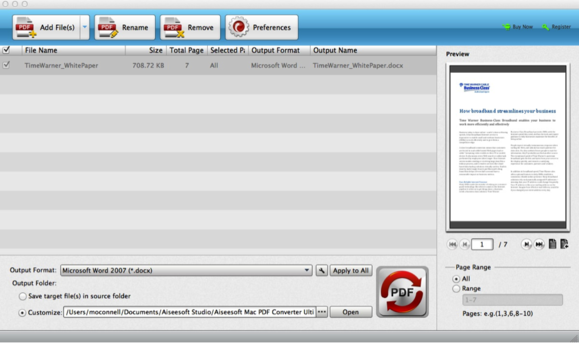 Aiseesoft’s PDF Converter Ultimate doesn’t just let you strip the text out of a PDF for editing, it lets you convert the PDF directly into the format of your choice. Long treatises can be converted to Word, HTML, PowerPoint, or even the ePub e-book format. Integrated OCR (Optical Character Recognition) software even accurately converts scanned, image-based PDFs directly to text that you can edit to your heart’s content. Plus, PDFs loaded with charts and data can be converted for use in Excel, where you can use formulas and sorting to get all that information under control. PDF Converter Ultimate supports more than a dozen formats into which you can convert any PDF document, and with our exclusive discount for Macworld readers, it comes at a price that anyone can afford. This story, "PDF: What it is, when it’s used, how to convert and edit it" was originally published by BrandPost.